Scholarship recipients Brett McFarland, Maracea Chase and Francis Geronimo Louie. 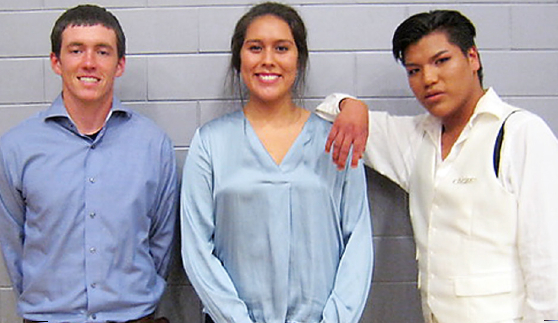 GALLUP, N.M. — Three scholarships in the name of Korean War Medal of Honor recipient Hiroshi “Hershey” Miyamura were given on May 2 as part of the eighth annual Senior Recognition Night at Hiroshi Miyamura High School in Gallup. Maracea Chase will attend the University of Southern California as a creative writing major with a minor in either film production or animation. She is a member of the Navajo Nation with Hopi and Sioux heritage. Francis Geronimo Louie will study clothing, textiles and fashion merchandising at New Mexico State University in Las Cruces with a goal to become a fashion designer. He comes from the Navajo Nation tribe and Mescalero Apache band. Brett McFarland will also attend New Mexico State University Las Cruces to pursue a degree in mechanical engineering and/or kinesiology. He plans to work in athletic training or designing prosthetics for people who have lost limbs. Miyamura High School offers students an opportunity to take vocational skills classes in addition to college preparatory courses. These technical classes include carpentry, plumbing, welding, culinary arts, telecommunications and broadcast news media. Miyamura received the Medal of Honor while serving in the Korean War as a machine gun squad leader with Company H, 7th Regiment, of the 3rd Infantry Division at Taejon-Ni. When overrun by Chinese Communist forces, he ordered his men to retreat while he held off the enemy with a machine gun, a bayonet and his own hands. More then 50 of the enemy were killed before Miyamura was wounded and captured. After spending 28 months as a prisoner of war, he was released on Aug. 23, 1953 at the Freedom Village in Panmunjon, South Korea. Contributions to the scholarship fund can be sent to Hiroshi Miyamura Scholarship, c/o Miyamura High School, 680 S. Boardman Ave., Gallup, NM 87301.